Pretty much every home has a fridge, a freezer or a combination unit. They are invaluable tools in the modern world for helping us to store food correctly and safely, making perishables last longer. We have a wide range of foods and diet available to us now thanks to the fridge and the freezer and it is impossible to underestimate the impact they have had on the domestic kitchen, even for those of us who can’t or won’t and probably shouldn’t cook! However, like all household appliances fridges and freezers cost money to run and since they are on 24 hours a day all year around they do use a lot of electricity. So it is important to make sure that your appliances are running at maximum efficiency to save you electricity and more importantly, money! Here are some top tips for helping to make sure you are getting the most from your fridge and freezer. 1. Don’t overfill your fridge. Inside your fridge the cold air needs to be able to circulate as this is how it keeps the food chilled throughout. 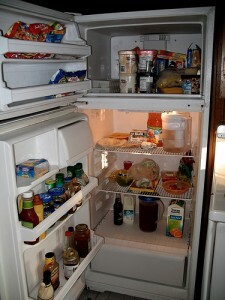 If your fridge is crammed full the unit has to work even harder to make sure the air can circulate. 2. Keep your freezer nearly full. It’s the opposite of a fridge. Freezer’s work at their most efficient when at least 75% full. The less space available the less the freezer has to do to keep the temperature down. 3. Defrost your freezer regularly. Some modern freezes have an automatic defrost setting, but if it doesn’t don’t let the ice build up above about a ¼ of an inch or around 6 millimetres. This level of ice will mean the freezer is working much less efficiently. 4. Check the door seals. If your appliance door doesn’t shut tightly then you are letting warm air in and cold air out, as well as making the unit work even harder to compensate. Make sure that the sills are still in condition and making a good seal to ensure that you are running efficiently. 5. Keeping the back clean. The back of the units is not an area we go regularly but this is the place where the dirt and dust builds up and can stop a fridge or freezer from not working correctly. Every now and then give it a quick clean and free of dust. 6. Take care when positioning appliances. Make sure that you try to keep fridges and freezers away from sources of heat, like cookers, or even direct sunlight. If you have to place units close to each other, try to leave a gap between. 7. Take care with hot food. It’s common sense but if you have hot food leftovers, make sure you let the food cool before placing it into the fridge. Not only does the fridge have to work harder to compensate but you could inadvertently put other food in the fridge at risk. 8. Use your fridge thermostat correctly. Make sure it is set right for your fridge within the manufacturer specification and your usage. If your fridge doesn’t have a thermostat then you should consider getting one. For final advice, if you have an older model fridge or freezer you should consider replacing it with a modern more energy efficient one, or replacing the parts which are not performing efficiently. Most parts can be purchased online. Just remember to make sure to dispose of your old appliance and/or parts correctly. Follow this advice and soon your fridge and freezer will run most efficiently, saving you electricity and money! Thanks for the great tips! I really learned a lot, especially about the air circulation part, which was something I hadn’t thought of before. thanks for the uesful information! I do get a lot from it!